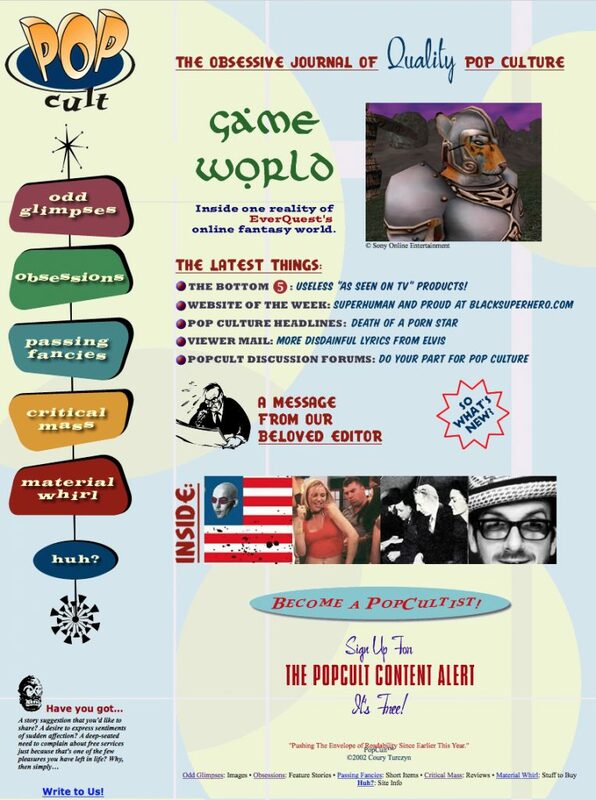 At the turn of the century, I had an idea for a magazine that I really wanted to read: one that explored pop culture in depth rather than as celebrity news. So I created a sample edition, wrote up a proposal/manifesto, and sent it out to publishers. While I was able to get replies from editorial directors at Conde Nast and Time Inc. (among others), they weren’t exactly encouraging. “Why do we need yet another entertainment magazine?” they demanded. I used jpegs for all the headlines because they looked cooler that way, which would surely give one of today’s SEO experts an instantaneous aneurysm. It also combined a lot of elements that current websites focus solely on, like nostalgic galleries, product reviews, “newsy” blog posts, forums, etc. And then I added “secret” pages that you could only discover by accidentally hovering your mouse over just the right spot. Fun! But it was probably too diffuse and uncoordinated to gain much traction. Despite all that, PopCult did get some attention in USA Today, Time Out New York, Yahoo!, and the Christian Science Monitor (!). The Internet was a lot smaller back then and people were easier to impress. However, I never figured out how to make an income from the site and eventually ran out of time to work on it when life intervened. But now that my 20-year career in journalism has gone up in flames, I’ve decided to resuscitate the old domain to provide not only an archive of my work (much of it previously published by the two papers I edited, Metro Pulse and the Knoxville Mercury), but also to reexamine the things and people I find interesting. Let’s call it a blog! If you like these stories and find yourself in need of a writer or editor, please contact me: coury@popcultmag.com.